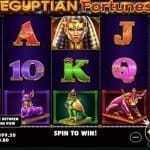 Temple Of Nudges is 5 reels and 243 Paylines slot machine powered by Net Entertainment. You can play this newest slot from NetEnt using your mobile phones, tablets or desktop with coin sizes of 0.25 Eur up to 250 Eur per spin. Temple Of Nudges slot offers a jackpot of a whooping 2,187 times on your total stake and it means if you are playing with the highest available bet per spin then the chances of winning huge amount of money becomes very easy for you. 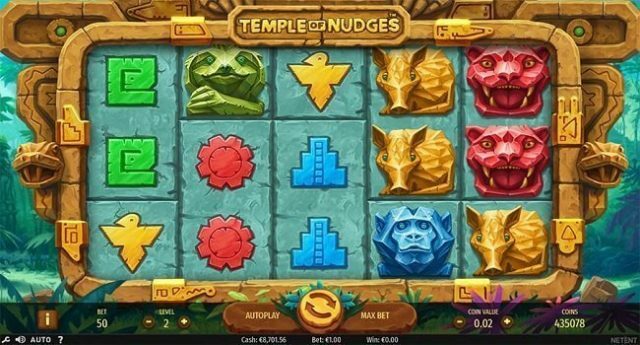 Temple of Nudges slot is inspired by an Aztec/mystical theme which comes in with 2 features i.e. Nudge feature and Re-Spin feature. The slot is being set in the jungle where you would hear sounds of bird singing. The reel contains many symbols such as towers, birds, cougars, birds, sun, armadillos, monkeys, sloths and snakes. The cougar is the highest paying symbol which offers you 3, 6 and 9 times on your total bet if you land 3, 4 or 5 of these symbols on your payline. This game comes in with a Nudge feature in which whenever you get a winning combination then this Nudge feature will come in to play and the reels will down by 1 place and will form another winning combination for the player. 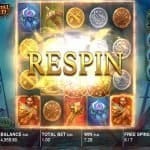 The Re-Spin feature- The Re-spin features comes in to play when re-spin symbol appears in your winning combination. This feature will be triggered and you will be allotted a re-spin. Though, there is no scatter symbol or wild symbol in this game but you could get another re-spin during this process. 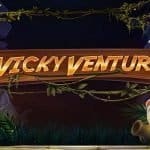 This is a good and impressive slot machine but I would go with NetEnt’s Vikings (which is based on a popular TV series) which can pay you a good 10,000 times your bet on every free spin.